Summer is my favorite season. There isn’t anything I don’t love about it. Baseball, clear skies, thunderstorms, sparkling blue swimming pools, heat, long evenings, dragonflies, flowers, green grass, tennis, boats. The mosquitoes are bad this year. I don’t like them. They’re killing me. I’m surprised I don’t have malaria by now. 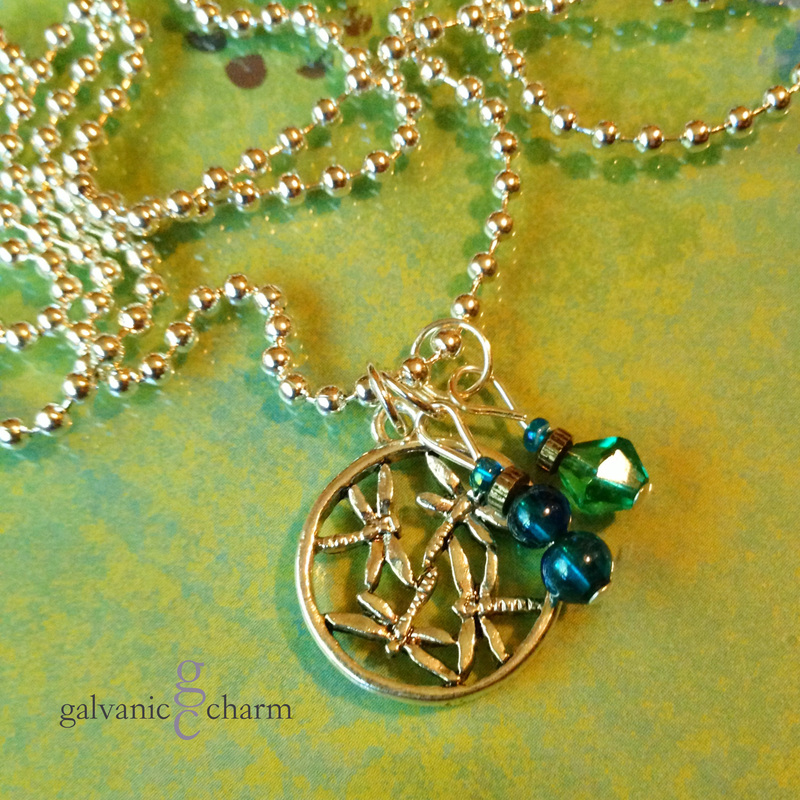 Anyway, here are a few summer designs by Galvanic Charm. Hop over to Etsy or Facebook to order! Or you can even send me an email! DRAGONFLIES – Revel in lazy days, cool water, and warm nights. Pewter dragonfly circle pendant, accented with Czech glass beads in shades of blue and aqua. 24″ stainless steel ball chain. $25 as shown. 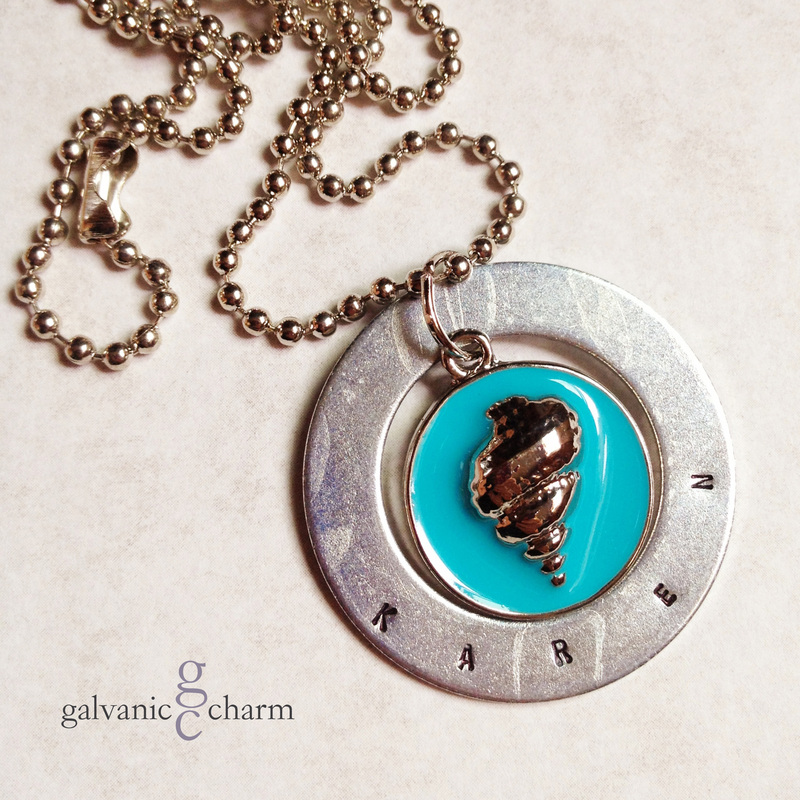 SPIRAL SHELL – Personalized necklace with single washer (35mm diameter) and stainless steel sea-themed pendant accented with turquoise-colored lacquer. Available in spiral shell (pictured), starfish or conch designs. 24″ stainless steel ball chain. $30 as shown. HAPPY 4TH – Show your patriotic colors! 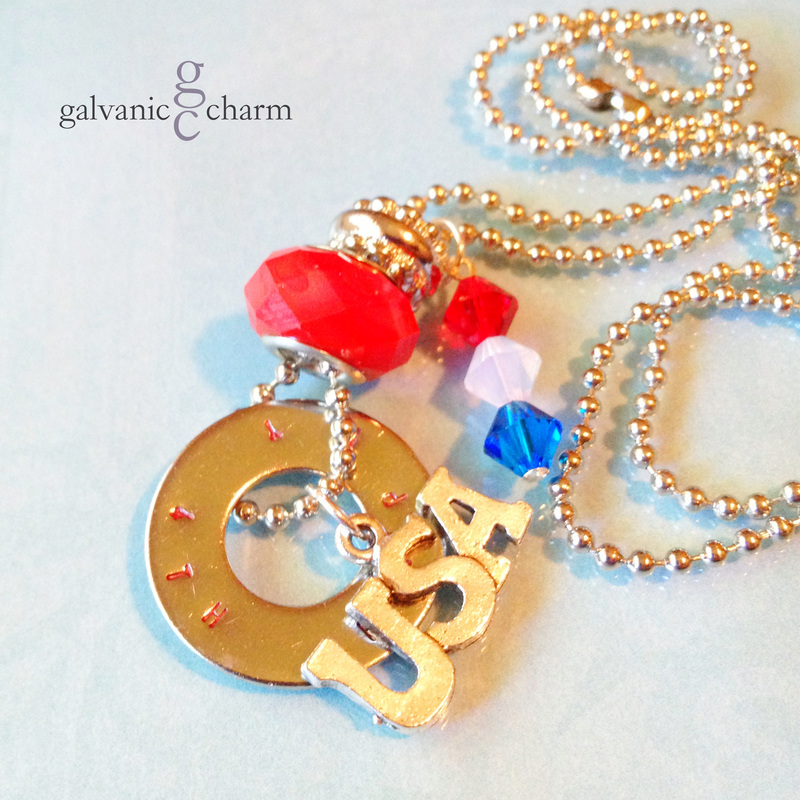 Single hand-stamped washer (happy 4th), pewter USA charm, red, white, and blue Swarovski crystals, red resin and pewter beads. 30″ stainless steel chain. $30 as shown. $35 with a personalized washer added.